This one goes back all the way to my very first post on Driving in DC. 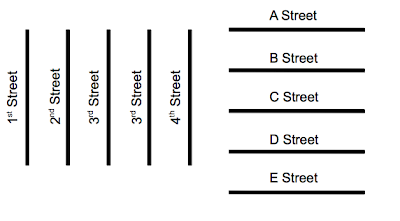 I mentioned that DC is laid out on a grid with numbered streets running north-south, and lettered streets running east-west, and stated that this was nearly a wonderful idea. This post will explain my use of the "nearly." Seems simple, right? 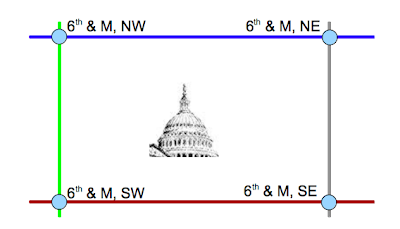 Kind of like Manhattan's grid system, where the avenues go north-south and the streets go east west, Washington, DC should be a similarly easy place to navigate? To illustrate, let's say you're new in town, you've heard great things about the new Arena Stage, and a friend told you it's at the intersection of 6th and M. If that's all you know, you have a 25% chance of finding the right spot on your first guess. 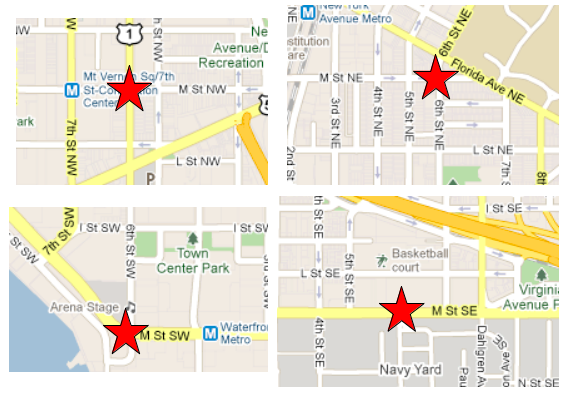 6th and M NW is basically one block over from the Convention Center. 6th and NE is almost the main entrance to Gallaudet University. 6th and M SE, technically, doesn't exist (6th street is blocked by the new Marine Barracks) but it's the entrance to the Chief of Naval Operation's house at the Navy Yard. 6th and M SW is the Arena Stage. This may seem trivial or minor, but when I used to live in Southwest DC, three or four times per year I would have to redirect some poor lost soul who had mistakenly wandered into the wrong quadrant. 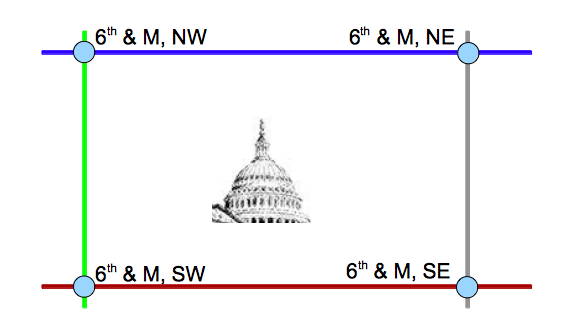 People who live in DC or have to navigate there often learn to instinctively pick up on the "NW" or "NE" label (or just assume NW if there is no other distinguisher), but for any newcomer, beware. It makes a BIG difference.